A heat pump moves heat. It can either move heat from outside to inside (to provide heating inside a building) or from inside to outside (to provide cooling inside a building). Fridges and freezers are examples of heat pumps that move heat from inside to outside the appliance. 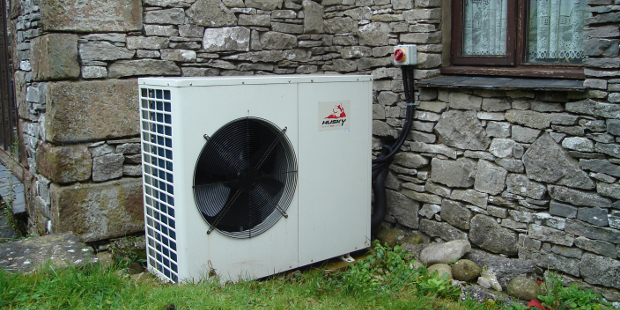 Heat pumps can either be ground source, water source or air source. Ground source heat pumps involve large boreholes or slinky systems to bring heat out of the ground, whereas air source systems are easier to install, simply taking the energy out of the air outside of a building. Because heat pumps generate low temperature hot water (35°C-55°C) compared to the 60°C-70°C normally found in building heating systems, a large surface area is needed for the internal radiators of the building. This can be achieved using under floor heating, or large radiators. Additionally, fan assisted radiators can be used to ensure there is adequate heat transfer.